When Peter Erasmus (1833 – 1931) was an “old timer” in the 1920s, he dictated the story of his life to a man named Henry Thompson. The manuscript of the first half of his life was eventually published as Buffalo Days and Nights. I consider it one of the single most fascinating books about the fur trade era and the time of transition and trauma that led to the destruction of the great bison herds, rebellion, and settlement. My copy of Buffalo Days and Nights by Peter Erasmus. 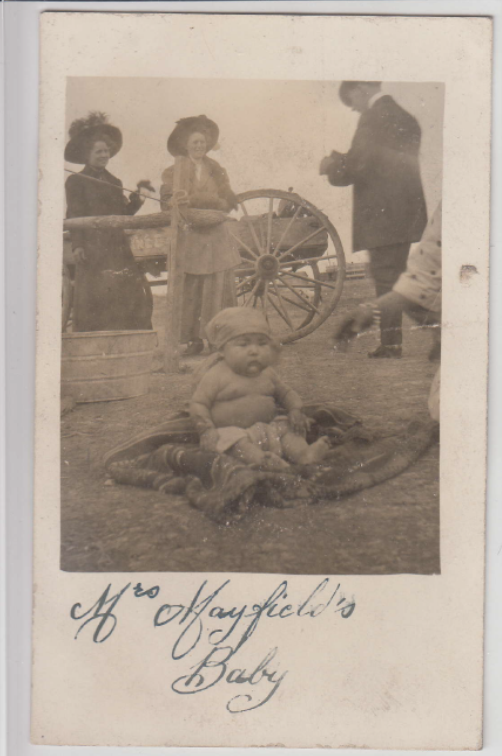 Erasmus makes mention of an HBC clerk called Harrison Stevens Young who could understand “some Cree but not enough to carry on a conversation.”(286) Even though he was an Englishman, Cree was something one had to learn out West to be useful. Interestingly, none of the Indigenous characters in Erasmus’s work speak with broken English as they are often transcribed in other contemporary sources. The only people written as speaking bad English are French people and one black man. Indigenous people are written as eloquent speakers because they were speaking to Erasmus in their native language, which Erasmus understood. We now think of what is now western Canada as being overwhelmingly Anglophone (English-speaking). Many people assume that because the region is now majority English-speaking, it has been so since the first Europeans arrived. That was not the case. The documents written by the Hudson’s Bay Company, which are often cited by historians of this time period, were in English, but that’s because they were written by clerks who were writing for bosses in Fort Garry and London, England. It was an English company so the documents were written in English. Monolingual historians don’t always think of seeking out documents in other languages. Sometimes it’s not that the documents aren’t there, it’s that many historians can’t read them. Just because many English-language documents were produced in what is now Western Canada in the 1800s doesn’t mean that English was the most useful language for people on the ground in the West, though. Far from it. Artist Paul Kane, travelling in the west the 1840s, complained that at a celebration at Fort Edmonton, he could only speak to people at the head table because nobody else spoke English. ‘Peter,’ I snapped out. I was getting tired of having guns pointed at me. ‘Give your last name and the name of the man you were with today,’ the voice spoke out of the darkness. In this scenario, this final line makes clear that this whole conversation was happening in Cree, and that speaking good English even as late as 1885 was a distinguishing enough characteristic that would have identified Erasmus on the spot because it was so unusual. Only one generation later, English started to become the more dominant language in the West, largely due to the influence of schools and the influx of waves of Euro-Canadian settlers facilitated by the railroad. Even so, well into the 1900s, there were still many “old timers”, of Indigenous and European descent, who still used Cree as a means of communication. One of the main things historians do is think critically about the sources of their information. However, too often we look at sources in translation, in our own native languages, or the only sources available are contemporary transcriptions of translations of varying and unverifiable accuracy. We need to remember that what is now Western Canada has always been home to dozens of different languages and different world views, and we need to seek out sources that represent that. By reading English-only sources, we’re getting a clouded and second-hand view of events. The story of Peter Erasmus’s life reminds us that despite what our documents imply, English wasn’t the most useful language in the West in the 1800s: Cree was. Buffalo Days and Nights by Peter Erasmus, as told to Henry Thompson. “As an Elder once said, ‘Learn one Cree word a day for 100 days, and emerge a different person.’ Neal McLeod, 100 Days of Cree. “Peter Erasmus and Storytelling” by Tom Long, all about a comic book project about the life of this interpreter. Kane, Paul. Wanderings of an artist among the Indians of North America: From Canada to Vancouver’s Island and Oregon through the Hudson’s Bay Company’s territory and back again. London: Longman, Brown, Green, Longmans & Roberts, 1859. Dramatic display of taxidermy bison on the top of a cliff. This is the only tipi I’ve ever seen made of leather. Prior to the arrival of European canvas, cow bison hides were the preferred material for making tipis. Various Blackfoot stories were projected onto rocks throughout the more traditional museum displays. A replica archaeological dig at the base of the indoor cliff. 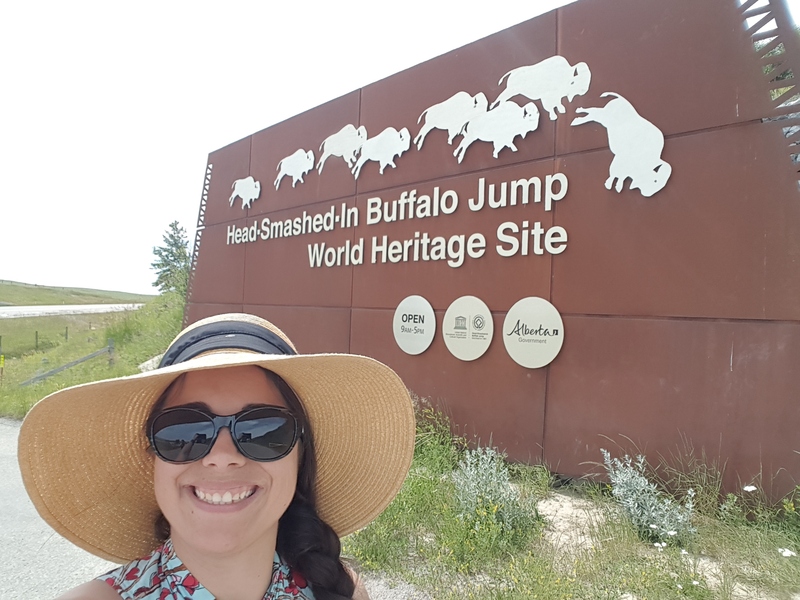 Head-Smashed-In interprets 6,000 years of buffalo hunting by Indigenous peoples and is comprised of the buffalo jump itself (an archaeological site) as well as an amazing interpretive centre. It tells an archaeological story, but also shares Blackfoot culture with visitors. As far as I can tell, all of the site’s interpretive guides are Blackfoot. They’re telling the stories of their own people and heritage, which is very powerful. The museum does an excellent job of weaving oral history, Blackfoot perspectives, the natural history of the region, and the archaeological record together in a cohesive, respectful, and absolutely fascinating way. Replicas were sometimes on display where, for example, actual medicine bundles would have been inappropriate for the public to view. The museum building was built into the cliff itself, making it feel a natural part of the landscape. What I really love about this site is that they really give you a good sense of place. The story would not be nearly so powerful if told elsewhere. They encourage you to start your visit with a view from the top of the cliff: the top of the buffalo jump itself. Before you even read any interpretive panels or look at any historical images or artifacts, you look out at the landscape itself and get a real feel for the immensity of the buffalo jump. While we were admiring the view, we met one of the Blackfoot interpretive guides, Stan Knowlton, who has lived in the area his whole life. He shared some amazing stories about his encounters with buffalo; rancher-owned buffalo in the area sometimes escape and he once memorably encountered a bull and a few cows at the top of the buffalo jump’s cliff. (They ran off after snorting at him.) He parsed meaning from the landscape for us, pointing out, for instance, spots where buffalo used to cross the river. We followed him inside the museum and learned some of the deeper symbolism of the Blackfoot tipi and Blackfoot place names for this region. Stan blew my mind when he made the connection between the Belly River, the Elbow River, and other sites explicit; they are all the body parts of the Old Man who is lying down on this land. For some reason I had never stitched those disparate place names together before! What I am saying is that I heartily enjoyed listening to him speak and spark connections in my mind. While the artifacts and the displays were very informative and well-designed, I always believe that it is the staff that bring really meaningful connections with visitors. We finished our visit after the museum building closed with a walk at the base of the buffalo jump. We bought the $2 walking tour pamphlet which helped us understand what we were seeing. We stood on the spot where hundreds of bison were butchered. We saw a tipi ring that was left behind by people an age ago. We learned that while the cliffs are now “only” 10 metres high, they were once twice that tall; the ground is composed of layers and layers of buffalo bone beds, covered with dirt blown by the fierce prairie winds. We saw berry bushes in bloom which are still used by Blackfoot people today. We saw deer browsing on bushes, ground squirrels scurrying through the long grasses, marmots posing on boulders, and Northern Harriers gliding in the strong wind. The atmosphere of the wide open space was incredible. And in the distance, in some rancher’s paddock, just barely visible to the naked eye? A small herd of buffalo. Historic sites and nature preserves are not separate, in my mind. All natural places have a history. Head-Smashed-In Buffalo Jump does an excellent job of blending history, natural landscapes, and contemporary cultures. Head-Smashed-In Buffalo Jump is just 15 minutes West of Fort MacLeod, conveniently on your way between the city of Calgary and Waterton Lakes National Park. Bryan, Liz. Stone by Stone: Exploring Ancient Sites on the Canadian Plains. Edmonton, AB: Heritage House Publishing Company Ltd., 2015.